Catoctin Mountain rose from a primordial lake to heights taller than Mount Everest. As time wore it away, many of its secrets were lost with its dwindling peaks. In the era of man, though, its history has been better preserved, although it still holds onto its secrets. 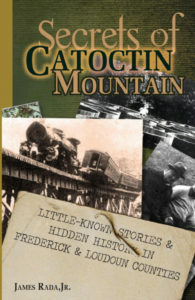 In his new book, Secrets of Catoctin Mountain: Little-Known Stories & Hidden History of Frederick & Loudoun Counties, James Rada, Jr. (Catoctin Banner contributor/editor) tells the stories of Catoctin Mountain, its people, and places. Residents of Northern Frederick County treasure their association with the mountain, but it actually runs south from Thurmont until nearly reaching Leesburg, Virginia. The more than two dozen stories in the book take place all along Catoctin Mountain. You can hunt for the snallygaster and dwayyo, legendary monsters that roam the mountain ridges. Discover what it took to become a spy at the secret OSS training camp on the mountain. Search for a forgotten gold mine in the foothills of Catoctin Mountain. These are just a few of the stories included in Secrets of Catoctin Mountain, telling the tales of ordinary people living their lives under unusual conditions at times. Taken together, they paint a picture of the character of the people who live on and around Catoctin Mountain, whether they are from Maryland or Virginia. Rada considers “secrets” in this book as stories that aren’t widely known. He gave as an example a presentation he recently did at the Garrett County Historical Society about his book Secrets of Garrett County. He told the audience about a half a dozen of the “secrets” from the book. Secrets of Catoctin Mountain contains sixty-four black and white photographs and illustrations that help bring the stories to life. Secrets of Catoctin Mountain is the second in a new series of books that Rada is writing about regional topics. The first, Secrets of Garrett County, was released earlier this year. James Rada, Jr. is an award-winning writer whom the Midwest Book Review called “a writer of considerable and deftly expressed storytelling talent.” Small Press Bookwatch said that Rada’s coal-mining book, Saving Shallmar: Christmas Spirit in a Coal Town, was “highly recommended.” He has two dozen writing awards from the Associated Press, Society of Professional Journalists, Maryland-Delaware-DC Press Association, Maryland State Teachers Association, and Utah Ad Federation. Rada has been writing about history for nearly twenty years and still finds it fascinating and new. “History is not boring. It’s full of love, adventure, comedy, and mysteries that still aren’t solved to this day. It’s those types of stories I like to write, and I believe I’ve pulled together a great collection of them for this book,” Rada said. Rada is the author of twenty books, most history and historical fiction. His articles have been published in magazines like The History Channel Magazine, Boy’s Life, and Frederick Magazine. He also writes five local history columns for The Republican, the Cumberland Times-News, the Gettysburg Times, The York Dispatch, as well as The Catoctin Banner.